Patent office okays patent for "Diane's Manna"
so potent that it removes or alleviates depression, mood disorders, Attention Disorder symptoms, thought disorder, mental illness, pain, right lip retardation symptoms, physical problems, Lymph Node cancer and many other illness symptoms. It is extremely strong or potent and can be made weak to make your little Attention deficit child normal. It is an incredible mood stabilizer and reduces psychosis. Use it for cancer patient and for people with pain issues. It works. According to the patent, the supplement is "made from distinctly and uniquely combined and processed interchangeable seed and seed derivatives." The inventor provides extensive evidence of effectiveness based on her own personal experience. I have used all of the ingredients listed. These all are used for the claims. Please know that these are continual medicines and are very good if you take them and make sure your body is filled with these before you ever stop or halt using them. This drug is to be used by all people who hate going to the Pharmaceutical companies or going to doctors who have a great problem in diagnosing our illnesses. It is for the people to judge. I am very ill. When I get sick, it is imperative to make myself a large dose of this recipe and take a large dose for many days. It causes a mild psychosis in me during this phase. I have to endure that to get to the right dose. I always lower the dose to my needs, but only after I have flooded my body with enough of the medicine to create this continuum. The primary examiner at the U.S. Patent and Trademark Office (USPTO) was Michael Meller. This patent was recognized this week by the Electronic Frontier Foundation as the "Stupid Patent of the Month." I heard about it on BoingBoing. The EFF points out that the patent should have been rejected on any number of grounds, "including enablement, indefiniteness, and utility." I think awarding such a foolish patent undermines the government's credibility as an authority that can help consumers sort through conflicting evidence on diet and health claims. Here's another one. This is a Google Trends report of online interest in "sodium" and "gluten", 2004 to the present. High sodium intake in the U.S. population increases the prevalence of high blood pressure and heart disease, which are leading killers in the United States. Yet, this topic is ovewhelmed by the growing American obsession with gluten (an obsession that has become fully detached from any serious concern about celiac disease). Our third edition is out in August 2014, and the Japanese edition appeared in January 2013. Click here to read a review of the first edition (in ERAE), find it at your local bookstore or any online bookseller, request a review copy from Routledge, or visit our instructors’ website for lecture slides, extra photos and example quizzes. As fizzy soda sales decline, top beverage manufacturers seek to convince children and parents that kids need sugary sports drinks to enhance athletic performance. In truth, water is the best source of hydration for kids doing sports. Based on the balance of scientific evidence, the MyPlate text (.pdf) says it well: "Drink water instead of sugary drinks when you're thirsty." Plus, choosing bottled drinks instead of tap water is bad for the environment. Early this year, Gatorade, which is owned by PepsiCo, got a pile of bad press -- including a hard-hitting Civil Eats article -- for a marketing campaign featuring Usain Bolt, which used kid-friendly games to insinuate athletic performance claims and disparage water (see below). While reading up on that story, I came across this strange article in Snopes, which purports to fact-check a true rumor on the origins of Gatorade as a University of Florida Gators team drink, but which reads like advertising copy for the drink. The Snopes response reports as fact several marketing claims unrelated to the actual rumor at issue: "Other athletes who tried the drink soon swore by it, claiming it helped them go longer and finish stronger" and "Gatorade has since become an integral part of a number of sports." I am writing Snopes to suggest that the site revise its article. I'll update this post if Snopes responds. The Kellogg Company today unveiled new commitments to address actions by itself and its suppliers that affect climate change. General Mills on July 28 had announced similar initiatives. As stated in our Kellogg Global Supplier Code of Conduct, we expect suppliers to support our corporate responsibility commitments by implementing sustainable operating and farming practices, and agricultural production systems. Suppliers must strive to reduce or optimize agricultural inputs; reduce greenhouse gas emissions, energy and water use; and minimize water pollution and waste, including food waste and landfill usage. In the announcement today, Kellogg says it will set targets for greenhouse gas reductions, produce a climate change adaptation strategy, take steps to limit deforestation impacts in its supply chains, and commit to disclosure of key climate change information. Oxfam said Kellogg plans to participate in the Business for Innovative Climate and Energy Policy (BICEP) group and sign the Climate Declaration. Choices Magazine -- the outreach magazine of the Agricultural and Applied Economics Association (AAEA) -- this spring and early summer published a special series summarizing the Agricultural Act of 2014 (also known as the Farm Bill). After more than three years of debate on the next farm bill, the Agricultural Act of 2014 was signed into law on February 7, 2014. Overall, total spending under the new bill will be reduced by $23 billion as compared to the baseline over the next 10 years. The Agricultural Act of 2014 reforms the dairy program, includes major changes to commodity programs, adds new supplemental crop insurance programs, consolidates conservation programs, expands programs for specialty crops, reauthorizes important livestock disaster assistance programs, and reduces spending under the Supplemental Nutrition Assistance Program (SNAP). However, despite large cuts in total program spending, the Act continues to provide important programs to ensure a safe and adequate food supply and to protect our natural resources. The articles in this theme discuss new or revised provisions relating to commodities, crop insurance, dairy, conservation, nutrition, and specialty crops as included in the Agricultural Act of 2014. The series includes articles on commodity payments, conservation programs, dairy programs, crop insurance, specialty crops, and my contribution on nutrition assistance programs. 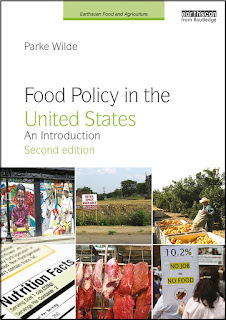 In its 2014 awards program, the Agricultural and Applied Economics Association (AAEA) has given honorable mention to my book, Food Policy in the United States, in the category "Quality of Communication." As publisher of the American Journal of Agricultural Economics and other top-ranked periodicals, AAEA is the leading scholarly and professional association in U.S. agricultural and applied economics. Though my book is highly multi-disciplinary -- designed to engage non-traditional audiences interested in food policy debates -- AAEA's recognition shows that the book also meets the exacting standards of the mainstream of my home profession. In summary, Prof. Parke Wilde’s Food Policy in the United States offers a big step forward in fulfillment of the AAEA’s vision and mission. 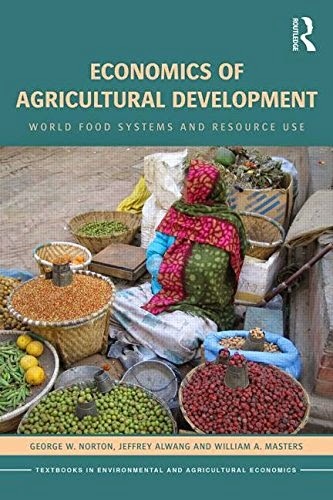 This book exemplifies the highest standard of scientific communication needed by our profession, first to help students in classrooms all across the country, and then to help graduates improve food and agricultural policy in Washington and elsewhere. I hope the AAEA's honorable mention encourages faculty to consider using this book for courses that address -- in a lively but rigorous way -- the immense student interest in food movements and food policy. Faculty members who are considering adoption may acquire a copy from the publisher. Here is a Google Trends report of online interest in "dietary guidelines" and "paleo diet", United States, 2004 to the present. Notice the two peaks for interest in "dietary guidelines," corresponding to the release of new Dietary Guidelines for Americans once every five years.